While flavors, textures and temperatures are critical elements of food enjoyment, one aspect that often lacks attention is the presentation. Food presentation is as impactful to patient appetite as other elements; hence the often-used phrase that we eat with our eyes. The Classic White Ceramic Ware is Cambro’s latest solution for an appetite boosting meal presentation. This matching collection provides an attractive yet home-like experience to patients and residents while allowing the staff to combat the most common complaint—temperature inconsistency. This is the first time in the healthcare market that ceramic bowls and mugs have a tight fitting lid. 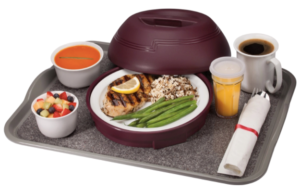 Cambro lids help provide heat retention, safe transport and prevention of spills during meal service. Even more importantly, it preserves garnishes for desserts, salads and soups that are served in the bowls. No more ‘plastic wrap smashed’ desserts! Cambro thought of the healthcare market and the many challenges that are not posed in other foodservice segments. Besides being the first ceramics with lids, Cambro ensure that the ceramic lids also fit Cambro Harbor and Shoreline style insulated meal delivery bowls and mugs! This limits the number of lids for customers to purchase and manage. A truly revolutionary solution for all of today’s challenging healthcare settings. With Cambro’s ceramics, staff can conveniently re-heat meals or keep desserts cold until ready for delivery, as the collection is oven, microwave as well as freezer-safe. A flavorful meal at the right temperature with an appealing presentation will help enhance patient appetite and overall attitude towards recovery.